WestGate@Crane Technology Park Welcomes JRC Integrated Systems, Inc.
JRC Integrated Systems, Inc. celebrates its new facility at the WestGate@Crane Technology Park. WestGate@Crane – October 9, 2014 – The WestGate@Crane Technology Park has grown significantly in 2014. In a matter of months, four new companies have chosen to locate at the Indiana’s only tri-county tech park. 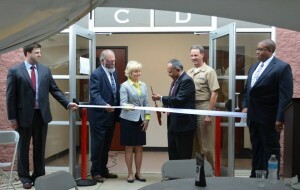 The latest company to seize a strategic location just one mile outside of Naval Support Activity (NSA) Crane’s WestGate, with direct access to dozens of defense industry partners and Crane’s impressive cadre of scientists, engineers, and leaders in the U.S. Navy, Marine Corps, and Army, is JRC Integrated Systems, Inc.
On October 9, against the backdrop of a beautiful fall day, JRC’s President and CEO, Dr. Tony Jimenez, joined Tech Park Executive Director, Don Schulte, Radius Indiana President and CEO, Becky Skillman, and Naval Surface Warfare Center (NSWC) Crane Commanding Officer, Captain JT Elder, to cut the official ribbon and praise the growing opportunities in the Crane region. Shulte remarked that JRC is bringing high-level clientele, working for two critical customers (SAIC and URS) to support national security. These partnerships, Schulte said, are what helps Crane become more effective and therefore makes the nation’s armed forces more capable and ready. JRC will join more than twenty other companies that have taken up residence at the WestGate@Crane Technology Park. They will be doing more than simply filling office space, however; they will be active partners with the naval base and the defense industry in South Central Indiana. “We can’t do what we do at Crane without our mission partners,” Captain Elder remarked. “We can’t do our business if companies like JRC don’t do theirs.” Of course, the business of NSWC Crane is to support a gamut of technical requirements for the armed forces, ranging from electro-optics and radar systems to special missions and electronic warfare systems. 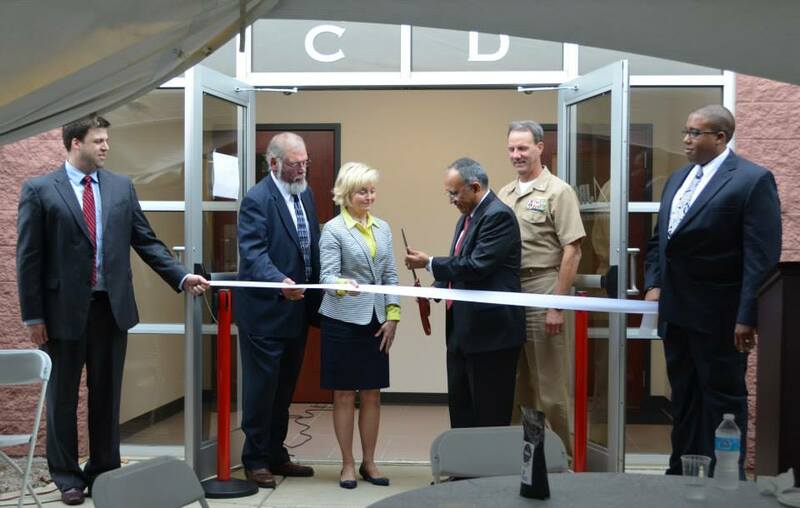 Crane’s technological advancements are used all over the world, and partners, like Radius Indiana, the area’s eight-county economic development organization, are helping promote the value of Indiana’s land-locked naval base. JRC supports NSWC Crane’s Strategic Missions focus area and has since 2011. The company’s expertise in Navy Strategic Weapons Systems (SWS) makes it a valuable addition to the defense industry working in partnership with Crane. JRC is a Service-Disabled, Veteran-Owned Small Business (SDVOSB) specializing in program management, advanced system engineering and weapon system independent verification and validation (IV&V). Founded in 2003, JRC is comprised of former military personnel, engineers, analysts, and technicians with extensive experience and expertise. Headquartered in Washington D.C., JRC also operates in Alabama, California, Florida, Georgia, New York, and Virginia.